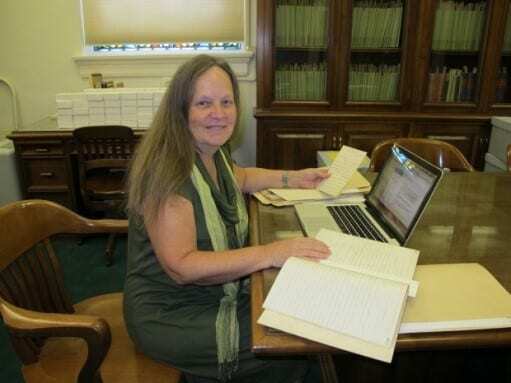 Below is a Q&A with Dr. Melinda Creech, Graduate Research Assistant at the Armstrong Browning Library and the driving force behind this digitization project. In the interview, Dr. Creech discusses how this project came about and highlights some of her favorite items in the collection. The Armstrong Browning Library will celebrate the release of this new digital collection with short presentations by Dr. Creech and Darryl Stuhr, Associate Director, Digital Preservation Services, Library and Academic Technology Services, on Thursday, November 29 at 3:30 pm in the Armstrong Browning Library Lecture Hall. A reception will follow in the Mary Armstrong Seminar Room. How did you become involved in the project to digitize the Victorian Collection and what role did you play in the project? I first came to work at the Armstrong Browning Library in the summer of 2011. One of my first jobs was to transcribe the letters in the Kenyon/Frizell Album that had been purchased in June of that year. The album had one letter from Robert Browning to John Kenyon, and two letters from Elizabeth Barrett Browning to John Kenyon. John Kenyon, an English poet and philanthropist, was Elizabeth’s distant cousin and introduced her to Robert. He became their dear friend. However, in addition to these three letters, there were eighty-three other letters in the album. Several were from other notable authors of the nineteenth century: Dickens, Carlyle, and Thackeray. As I struggled to read the handwriting of so many correspondents, I began to realize that although they may not have had the notoriety of the Brownings, all these people had led interesting lives and had fascinating stories to tell. There was not a comprehensive list of the Victorian letters. I remember asking about how many Victorian letters were thought to be in the collection. When I was told about 500, I was surprised, based on my personal experience with the letters, and asked if I could create a more comprehensive list of the Victorian letters, those not directly related to the Brownings. In the summer of 2014, I began the Victorian Letters Project. That summer Kara Long helped me to create a schema for collecting the metadata, and I spent the summer collecting the metadata from existing card catalogues, and continued adding letters discovered in albums, tipped into books, and hidden in other collections. In January of 2017, having collected all the metadata on almost 4000 letters, we began to make plans for digitizing the letters and manuscripts. Who were some of your collaborators and what roles did they play in making this digital collection possible? Jennifer Borderud, new director of the ABL, Darryl Stuhr, Assistant Director for Digital Projects, Allison Riley, Digitization Coordinator, and Kara Long, Metadata and Catalog Librarian, and I finalized plans for digitizing the Victorian Letters Collection at the ABL in January, and the work began. The letters had to be properly identified, transcribed, if necessary, housed, and transported to the Riley Digitization Center. 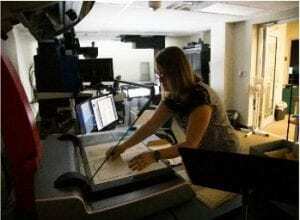 I was not involved in the process at the Digitization Center, which involved scanning the letters, editing and saving the images, processing the images, archiving them, recording all the processes, and returning the letters to the ABL. Once the letters were returned they had to be checked in and returned to their storage area. Many graduate assistants and paid staff, both at the ABL and the Riley Digitization Center, were instrumental in the completion of the project. I’m not sure I can recall everyone, but here are some who helped: Darryl Stuhr, Allyson Riley, Michael Galindo, Katherine MacKenzie, Sarah Rude, B.J. Thome, Evangeline Eilers, Josh Pittman, and Meagan Anthony. What aspects of the project were the most rewarding? The most rewarding part of the project was bringing to light letters and manuscripts that had been hidden for a long time. Finding the Dowden letters was thrilling. Mrs. Dowden had been a correspondent of the Brownings and of Dr. Armstrong. She lived in Ireland during a time of great unrest in the early part of the twentieth century. After corresponding with Dr. Armstrong for a while, she decided that her letters would be safer at the ABL. She sent the letters of her husband, Edward Dowden, first, and eventually sent her letters also to Dr. Armstrong, with the stipulation that they were only to be published after her death. The letters, almost 400, are filled with contemporary literary criticism. Prof. Dowden was the first English literature professor in Ireland. The letters had been safely stored in the vault at the ABL, and were undisturbed, I think, until I opened the drawer in 2016. I often write to scholars all over the world with questions about letters, and those questions have, in some cases, opened new avenues of research for them. Sometimes scholars responded to blogs that I had written about the Victorian Letters, and a lively correspondence grew between us. Those correspondents included a Dickens scholar in Ireland, a science historian in Germany, a religious biographer in Florida, a maritime museum curator in Greenwich, a Purefoy-Fitzgerald scholar at the Bodleian, Wordsworth and Carlyle scholars in Grasmere, and a Hopkins scholar in York. What aspects of the project were the most challenging? Four thousand letters are a lot of letters. Just collecting the metadata on that many letters seems an almost impossible job for one person to do. I suppose one of the most frustrating moments came after all 1100 letters that had been housed in the filing cabinets in the vault had been prepared, sent to digitization, returned, and refiled, when I received word that the scanning machine at the digitization center had not been working properly, and all the letters would have to be returned and scanned again. That was pretty discouraging, but the rescanning took a lot less time the second time around. What item or items in the collection are the most interesting to you? There have been many, many interesting stories associated with the letters. I remember how excited I was one afternoon as I was making my way through a bundle of letters that were related to the cartoonist Tom Taylor. Most of the letters were letters of condolences to his wife after his death. 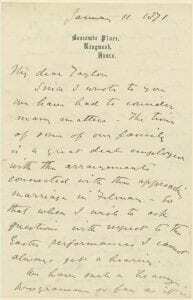 However among the letters I found one signed “Percy Shelley.” A quick bit of research revealed the letter was from the poet’s son, Percy Florence Shelley, and unlocked a fascinating story about the plays he produced in a theater in his own house. There was a letter from the artist and writer John Ruskin to his protégé, Lilias Trotter, who became a life-long missionary to Algeria. This was timely, because we were showing a film about Lilias Trotter’s life here at the ABL at the time. Her biographer was thrilled to find this bit of correspondence between Ruskin and Lilias. There are letters from writers, artists, musicians, scientists, explorers, clergy (even Baptists), statesmen, soldiers, and even cricket players. There are many letters related to scientists and explorers, artists and musicians, clergymen and politicians, and actors and stage managers. 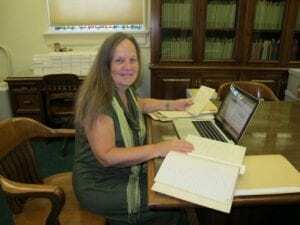 My hope is that digitizing these letters, which are outside the purview of the literary world of the ABL, will provide scientists, artists, musicians, and historians a new glance into the life of someone in their particular field for whom they have a passion. This entry was posted in Introducing…The Victorian Collection at the Armstrong Browning Library: a Baylor Libraries Digital Collection by Jennifer Borderud. Bookmark the permalink.